(My) Aware Electronics RM80 Geiger counter radiation testing from air filters and room fans for March to mid April 2014 from Bellingham, WA. Click to Enlarge. 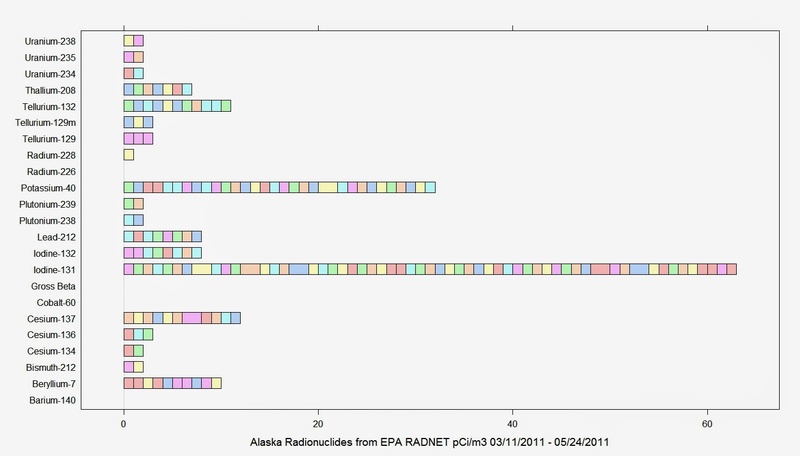 A bivariate trellis ("lattice") R graph of EPA RADNET air filter measurements for Alaska cities between 3/11/2011 - 5/24/2011. Click to Enlarge. Note: I am not a physicist, physical sciences researcher or anything of note. Just another father who wants to make sure his children aren't going to get cancer from Fukushima fallout. 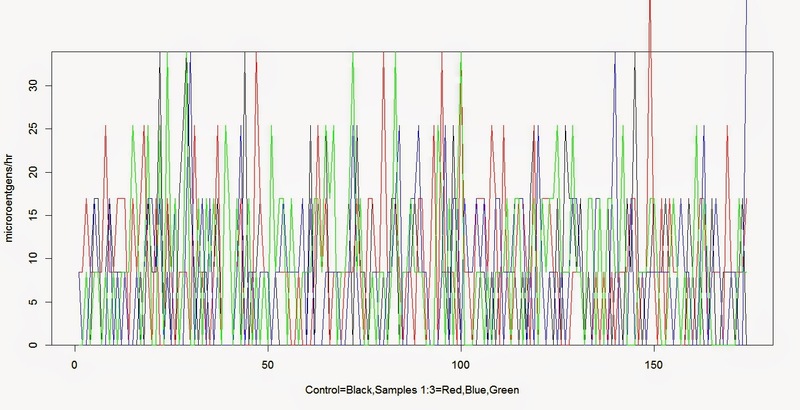 That's your warning to take your own samples and do your own data analysis before trusting mine. There are a number of serious problems when attempting to measure for origin and type of anthropogenic radiation versus background or so called NORML radiation. There are also a number of problems with measurement of radiation and interpretation of the safety levels of radiation. The top graph above is done with an Aware Electronics RM80: a sensitive PC based Geiger-Mueller counter that can register Alpha, Beta, Gamma radiation rates. The bottom graph is from data taken on 5/24/2011 from the EPA, most probably using a sensitive gamma spectrometer that can measure amounts of radiation by type. The cost of the first device is about $400. The type of device used for the second graph is for more expensive. Unfortunately, this difference in cost is preventing me from doing useful measurements of the effects of Fukushima in Bellingham. It looks like my air filters are showing higher than normal background radiation as measured by my Geiger-Mueller counter. But what I really want to know is what type of radionuclide is responsible for that radiation. Short lived radiation from various sources floats in the background of our lives. Some of it, if breathed in or ingested, can potentially have more devastating consequences on human anatomy than others. To get this kind of equipment, I am going to need a generous donor. If you are such a person, please contact me. R Code output for my recent measurements plus an aggregate graph is below. "Control is Oreck Desktop Room Filter Fan with Aware Electronics RM80 placed on exit vent." "Sample1 is taken by running RM80 evenly as possible over (removed from housing) Oreck 'MAX' room air filtration prefilter/filter." "Sample2 Tests for hot spots in high (MERV rating) air filter by running RM80 evenly and as widespread as possible. Filter is located outside 8 inch external air intake for approximately one month." "Sample2 : Both sides of filter tested while filter is encased in plastic freezer sack." "Sample3 Tests high (MERV rating) air filter located outside 8 inch external air intake for approximately one month." "Sample3 : RM80 stationary against center of filter without barrier." "Time Base Unit is 2 seconds. 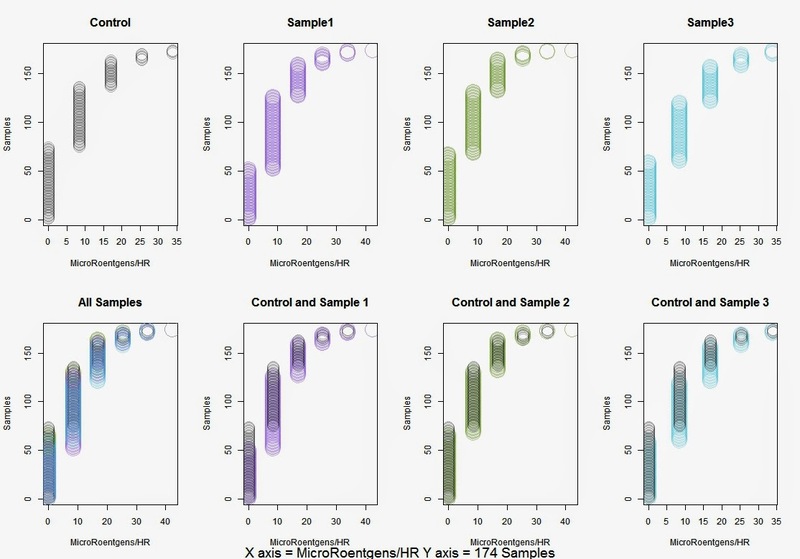 MicroRads_HR = microroentgens/hr"
 "Sample Statistics for Non Zero data only:"
 "Matrix Information for Non Zero Data"
 "Sending Four time-based Graphs of MicroRads_HR Averages Non Zero Data"
 "Sending Four frequency-based Graphs of MicroRads_HR Averages for Non Zero Data"
 "(Matrix) Sums of row based multiplication for non zero samples."